Nancy Ann Storybook dolls, tagged with my tags. 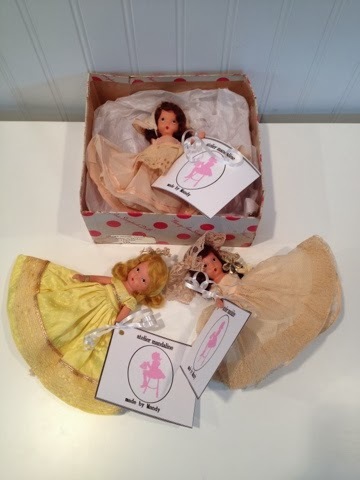 I went on a little shopping spree over the past week and my first order, a box of bisque Nancy Ann Storybook dolls, arrived quickly. I got to work quickly, as my store offerings are getting a bit thin. None of these needed too much work. I am always happy to find inventory that's easy to fix and sell. Right now my office is piled high with dolls and clothes needing a great deal of repair. 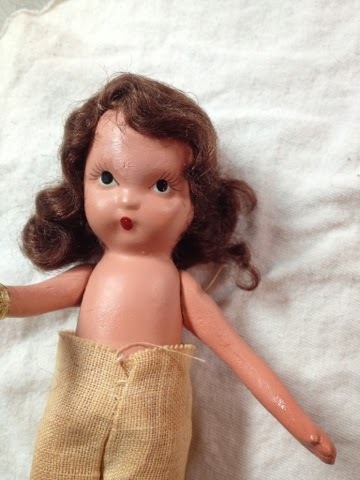 I think this is doll #120, "To Market". I started by trying to identify the dolls. Storybook dolls are terribly hard to identify, at least for me. I don't collect these. The company used the same numbers for different dolls, and they all have the same faces. Each doll wore a variety of different costumes even if they were supposed to be the same number and name. They are such a perfect small size, around six inches tall, they are very attractive to little girls and so many were also played with. The box that came with them is marked #120, "To Market", from the nursery rhyme. I reasoned one of these must be "To Market". Each doll has her original gold foil bracelet from her original tag, but the tag itself is missing from each. 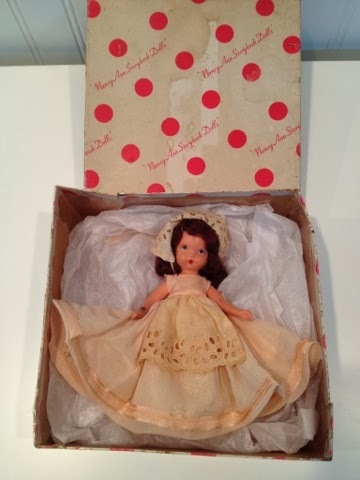 I think the doll in the pink dress with eyelet apron and headdress is most like the "To Market" doll, but her costume looks much more like some "Jennie Set the Table" or "Polly Put the Kettle On" dolls shown on the web site. 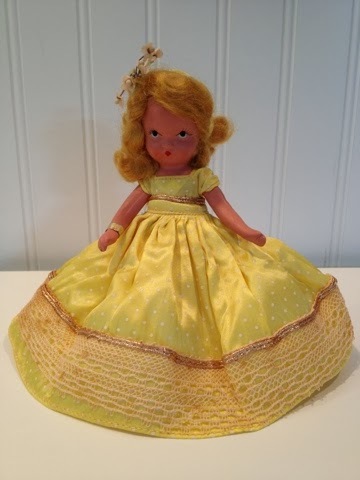 It seems like many of the domestic nursery rhyme dolls wear similar attire, though, so I think it isn't unlikely for "To Market" to wear this dress. Therefore, I am reasonably confident this is "To Market" It's certainly the most likely of these three. The doll in yellow might be "Daffy Down Dilly". She's in beautiful shape, the best of the lot. She still even has her original floral hair decoration, quite a feat for a doll from the early 1940s. 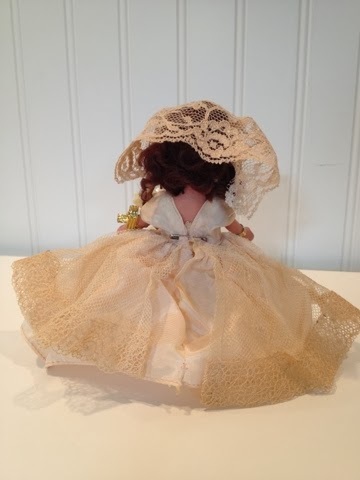 The doll in the lace dress was probably originally a bridesmaid. This might be "Daffy Down Dilly". 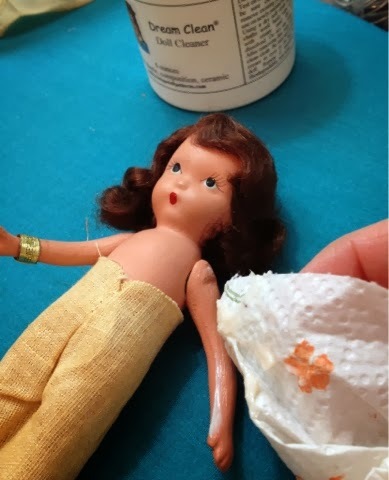 The Storybook dolls were a little dirtier than expected, and the original doll box was in pieces. I think the damage to the box happened during shipping, as it wasn't mentioned when I purchased the lot. 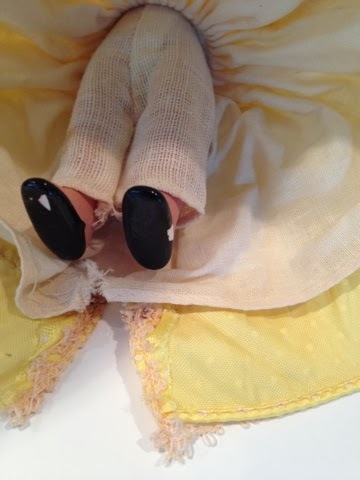 I started by cleaning the dolls' dresses. These obviously were displayed, but not much played with. The dresses are stained from age, the colors somewhat faded. They had some wear to the fabric and insect casings trapped in the folds. Nancy Ann dolls' dresses are pinned on with safety pins. Usually I remove these and replace them with a snap closure. All these fabrics felt too fragile for that. 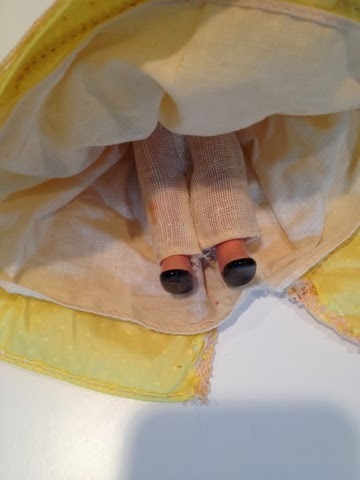 In fact, the yellow and pink dresses seemed likely to tear when I was trying to remove the tightly-fastened pin, so I cleaned these dresses right on the dolls. I was able to remove the lace dress, a good thing since it needed the most repair. I cleaned the dresses by spraying them with carpet and upholstery cleaner and gently dabbing them with white paper towels. While they dried I moved on to the box. 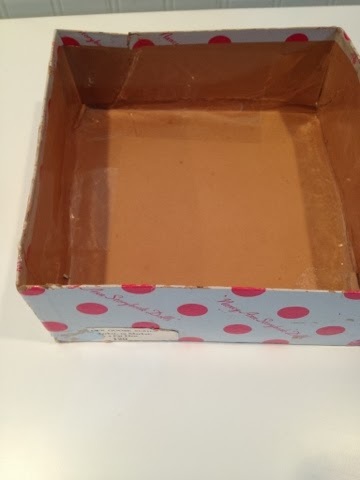 I repaired the box with tape. I tried to repair the box by taping it back together on the inside so the repairs don't show. I taped the sides all around the inside. One side was so damaged I had no choice but to tape it on the outside as well. Most of the repairs are hidden by the tissue paper inside the box, however. Some dresses had wear to the unfinished hems. I turned the frayed edges under with an iron. 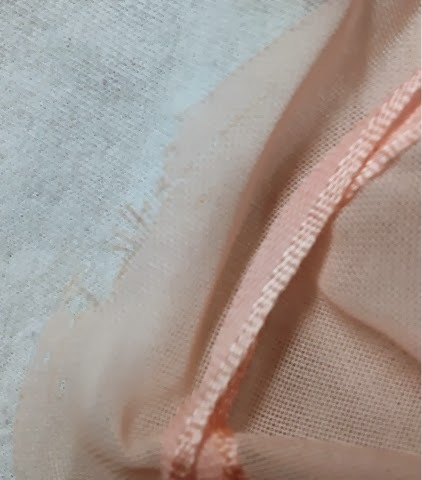 When the dolls dresses were dry I turned a hem under on the pink dress and the lace dress, since the unfinished edges of the fabric were fraying away. I didn't sew these in place because the fabrics are so fragile; I just ironed them. 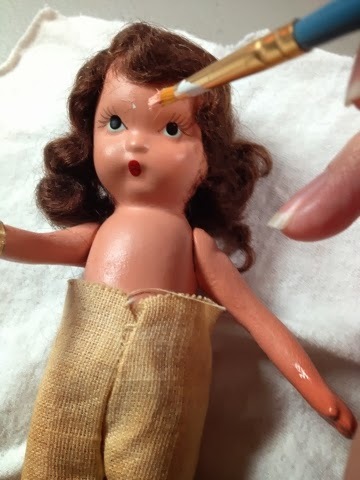 I cleaned the dolls with Dream Clean, which works on bisque and other materials. I like this cleaner because it gives a shiny finish. 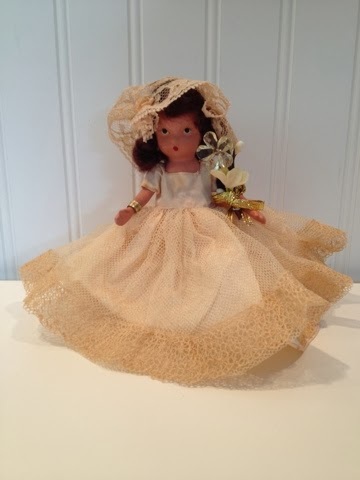 The doll in the lace dress had a chip on her forehead which worsened even with gentle cleaning. She had lots of crazing to the paint remaining, so I went ahead and painted her whole forehead to seal it and prevent more chips. I paint a chipped forehead. I got a good match to the original paint color, but you can see a difference in the sheen of the old and new paints. Of all three, this is the most damaged and appears to have had the most play. She has a spot of glue and a bald spot on the back of her head where I think a hat was once glued. 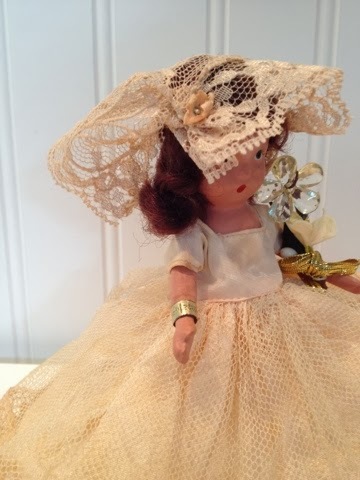 Most of the bridesmaid dolls wore large picture hats. Her dress looks beige but when you look inside it you can see it was once pale pink. I decided to turn her into a bride. The new veil covers the glue spot where her hat once went. I had a tiny piece of lace to match the dress, so I made a little veil that hangs over her forehead. I also had a vintage flower pin that came from a ballerina doll's wig. I used that to pin the veil in place. With the veil over her forehead you can't really see the paint repair at all! I pinned the veil in place with a vintage flower pin. Two of the dolls, the bride and the doll in yellow, had chips to their painted shoes. I fix these with Sharpie marker. Because the paint is likely to chip more if you agitate it, just dab the marker on the chips. Since the shoes don't show under the big dresses it isn't necessary to fix them, but I like to do a thorough job. I colored in chips on the shoes with Sharpie. 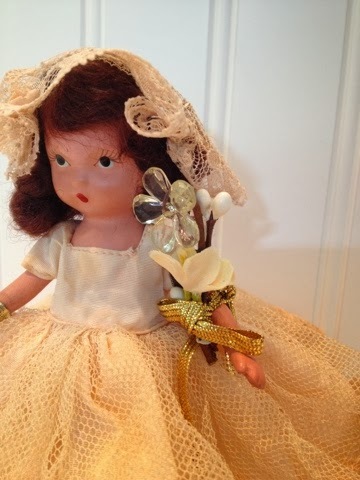 I made a little bouquet of vintage-look flowers and gold braid and tied it to the doll's arm. Now my Nancy Ann is ready for her nuptials! I think this would make a wonderful wedding gift or decoration for a bridal shower. I tagged all the dolls with my signed tag so they look sweet in a display. These are such cute little dolls, and their petite size makes them so easy to collect and display. They are also especially appealing to children. My custom Nancy Ann Storybook Bride. For children, however, the later 1940s or early 50s plastic Nancy Anns are probably a better choice than these bisque ones. Of course, the plastic ones aren't foolproof. Longtime readers may remember the rift between my mother and aunt which was precipitated by my mother melting my aunt's plastic Storybook dolls in a toaster. I tell that sad story in my Nancy Ann Storybook and Other Stories post. Sometimes I think maybe I will send my aunt some replacement Storybook dolls to end the bitter feelings! I will be listing all these sweet Storybook dolls in my store very shortly, so please check: http://stores.ebay.com/atelier-mandaline. Today was busy for me. 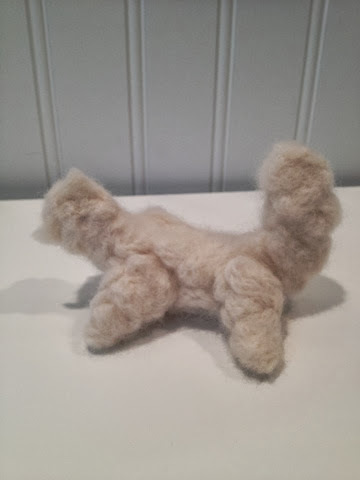 I finished the first of the alpaca animals I promised the children. My younger two requested bunnies. 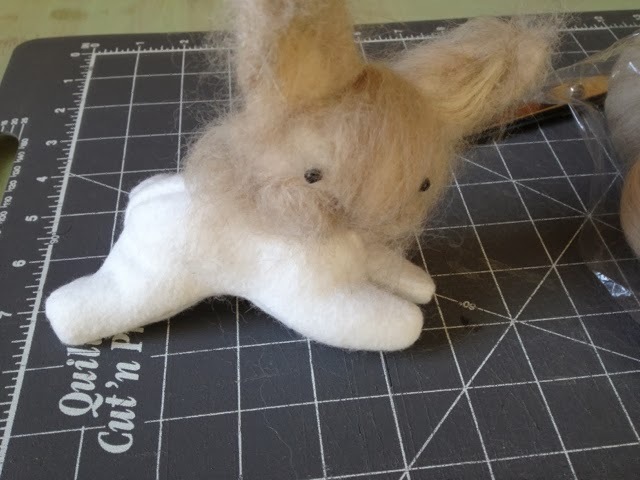 I told my teenager I was making alpaca bunnies and he said it sounds like a genetically engineered animal. How cute would those be? Take note, scientists! I want the first real alpaca bunny! We also celebrated our oldest son's birthday today so I made a cake for him. 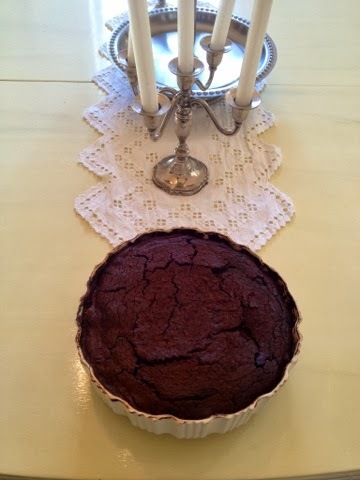 I found a great recipe from Gluten Free Goddess for a flourless chocolate cake. Instead of sugar, I used half xylitol and half monk fruit sweetener and I used unsweetened chocolate rather than dark chocolate. I also made a crust of almond flour, butter, and monk fruit sweetener. Otherwise, I followed this recipe: http://glutenfreegoddess.blogspot.com/2007/01/flourless-chocolate-cake_11.html. It was delicious, and hit the spot. 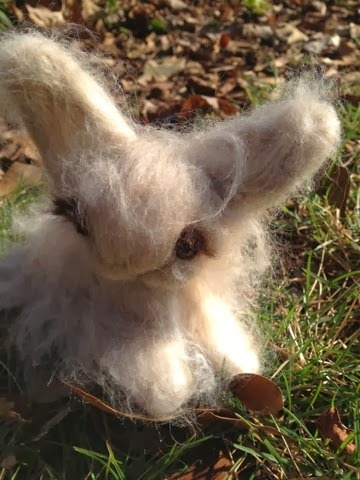 I made the alpaca bunnies the same way as my felted Barbie animals: first I sew a wool felt animal and stuff it with bamboo/rayon fiber. Then I felt the fur into the body. 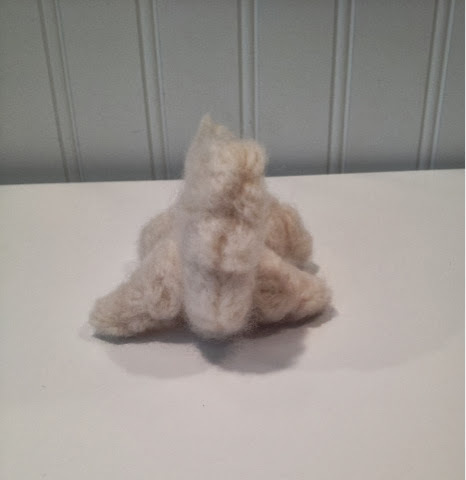 I used baby alpaca spinning top in fawn, accented with white, cream, and brown mohair. 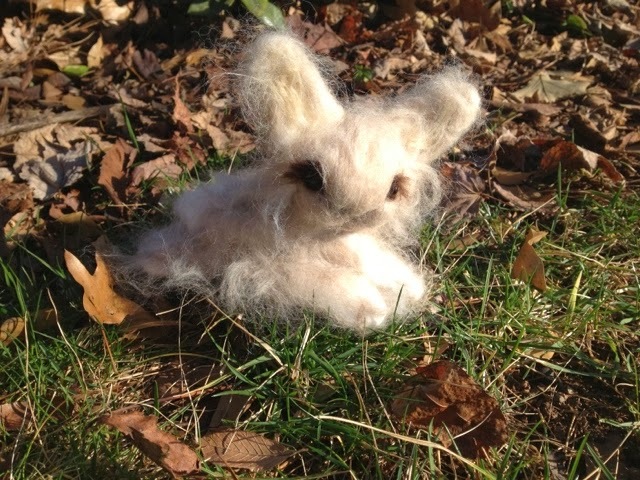 The eyes are Czech glass beads surrounded by felted mohair with mohair eyelashes. 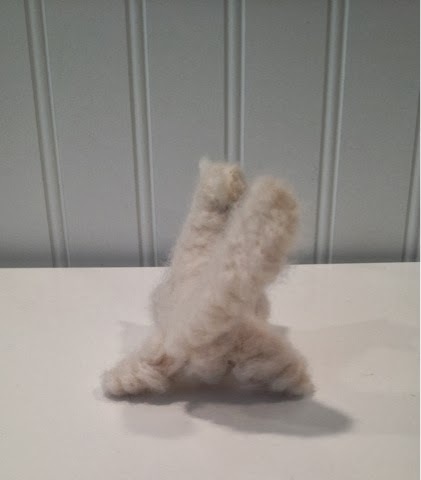 I want to refine my technique a bit so more of the soft alpaca fur is sticking out. Right now, to attach it I have to felt it all over, which gives it a curly look and makes it less soft. On the next one, I may try sewing the fur into the seams and then felting more on after the body is sewn. 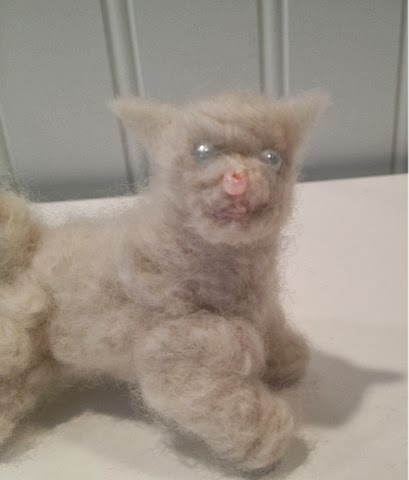 I used a vintage 1950s Betsy McCall dog and cat pattern as a starting point. I reduced the size by half and re-drew it into a bunny. You might remember from last year, I once had an exclusive Nosy dachshund pattern I drew to make companion dogs for the tiny Betsy dolls. I lost the pattern during the course of our move, however, so I bought the vintage pattern to make for Betsy. I haven't gotten around to that, but I think the cat, redrawn as a bunny, worked well. 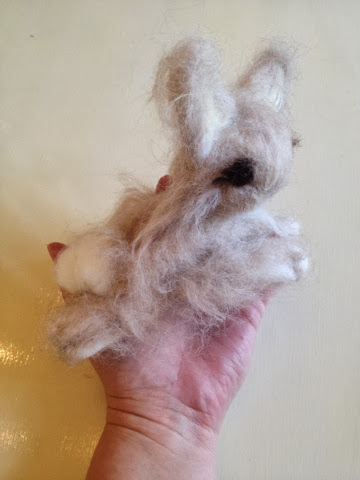 Now I have to hurry to make another bunny, since both my younger children are trying to lay claim to this one. The children were very impressed with the alpaca show. Even our teenager wants a stuffed animal made of alpaca. He wants a seated alpaca for his, so that will be my next project. I will have to draw that out, since I don't have any pre-made alpaca patterns. Of course, I will write of that when I've finished! If I have enough alpaca left over I may make some animals for my store. Make sure to check: http://stores.ebay.com/atelier-mandaline. These crocuses survived the recent snow. This week has been absolutely gorgeous. The temperatures are in the 60s and 70s, the sky is blue, and flowers are coming up all over. It really feels like spring. The trouble is, of course, that it isn't spring. A couple weeks ago we had six inches of snow and some of the coldest temperatures seen here for decades. Next week the temperatures are supposed to drop below normal, into the 20s again. So everyone here is sniffling and coughing. 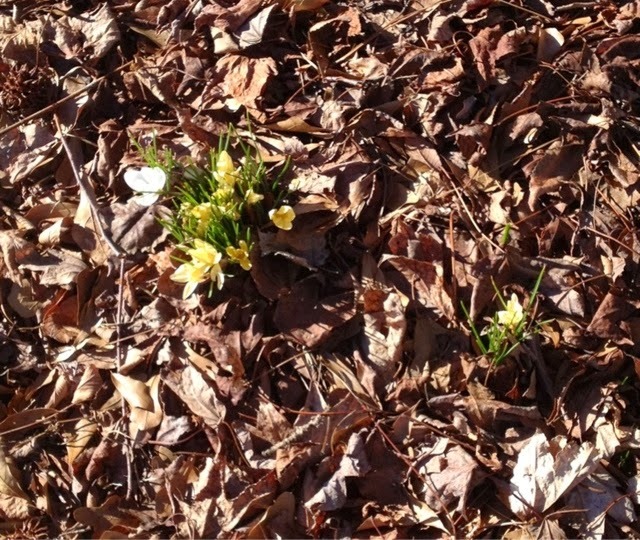 Our crocuses and daffodils are blooming. The crocuses can survive the snow; they came right back after the snow melted, but the daffodils will get zapped if they bloom right now. I tried to cover them with mulch to protect them from the snow but they powered right through the mulch and here they are. I guess I will bring a bouquet into the house. Besides feeling like spring, it smells like spring here as well. That's because I found a pot of Stargazer lilies on clearance at the grocery after Valentine's Day and brought them home. These are my favorite flowers, along with gardenias and roses. I love their fragrance. The bulbs must taste sweet, though, because I have a terrible time keeping them from being eaten in the garden. If I plant them in the back the dogs dig them up and eat them. Last year I planted some in the front and chipmunks dug them up and ate them. This year I may try to grow some in our fence boxes, maybe with chicken wire over top of the soil to keep critters out. 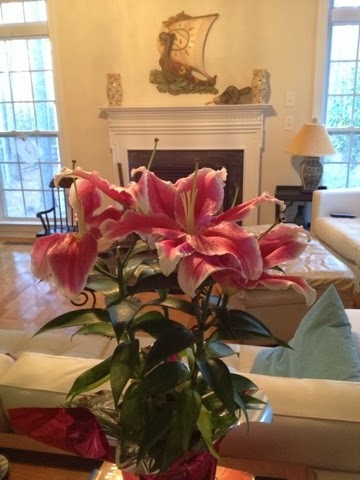 The whole house is fragrant with lilies. I wonder if my grandmother had these a lot or used the scent in home spray or something, because the other day when I walked in the back door it was suddenly as if I was walking into her house. It smelled just the same! I would guess we have only a day or two left before these flowers are done, but I certainly have enjoyed them this week. I will plant these bulbs in the fence boxes as well and see if they return next year. Since it's nice and warm we have been taking advantage by getting out into the garden. I put compost the other day and today I hope to get out and till it in. I used our Amazon points to buy a dual drum compost tumbler last year. We've been happy with it for the most part, but I wasn't thrilled when I found out how hard it is to get the compost out. You'd think you could just turn it upside down and it would pour out, right? Wrong! It sticks all in there and the opening isn't wide enough for a shovel. I tried using a spade, carrying the drums all around beating them on the ground, scraping it with a stick... finally I just reached in and pulled all the compost out with my hands (wearing gloves of course)! At least I got my upper body workout for the weekend! I guess I've taught the children well, because my daughter came home from school the other day with a wild chive she'd picked. She thought it was an herb she recognized and when I confirmed it she and my son went out and picked a whole bunch. People around here call this "wild garlic". At home they call it "onion grass". The garden columnist for the paper actually wrote an article the other day about how it's a "weedy nuisance" this time of year. I was shocked! Far from a nuisance, it's a great money saver! It's easy to see, because it sprouts in lawns before the grass grows up around it. It looks like greener, thicker grass, but you can recognize it further from its onion smell. When it's growing we travel all around picking it. It's especially abundant in municipal lawns, like in school yards. If you see it in your neighbor's yard ask if you can harvest it. Wash it very well (you don't know what anyone else might have sprayed in their yard). A 50/50 hydrogen peroxide and water mixture works well for washing. 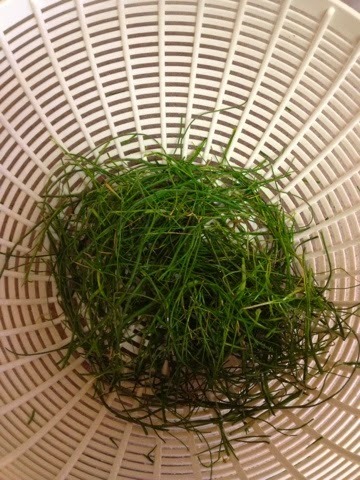 Then spin the chives dry in a salad spinner or set out on paper towels until dry, chop, and freeze. I just throw mine in freezer bags, but some people prefer to mix theirs with olive oil and freeze them in ice cube trays. Then you remove the cubes and keep them in a Ziploc bag so you can throw them into any recipe where they are needed. Herbs are so expensive, and frozen taste so much better than dried. Instead of treating this plant as a weed, why not EAT it and get it out of your yard that way? Another "weed" that doesn't give us any trouble? Dandelions. We eat these in salads or sauteed in omelets and soups before they ever get big enough to reproduce. In fact, I have to scout out less vigilant neighbors and municipal areas to supply us with dandelion greens, because ours have stopped growing in self defense! This year I want to expand the garden by several feet. We took a ton of saplings out to open up more room. I wish I knew a farmer with a truck who might give me some manure. It kills me to pay for it! Speaking of farmers, I've been trying for over a decade to convince the husband that I NEED to buy some goats or a cow and especially some chickens and a herd of alpaca. When my grandfather, who owned a popcorn farm, died I tried so hard to convince him to buy it. The farm had formerly been a sheep farm and the barns were still all set up for sheep, perfect for alpaca as well, but no luck! He was nice enough to drive us to Concord yesterday for the Carolina Alpaca Celebration. The kids loved visiting the sweet alpacas, and I was able to scout out some farmers around here who might be willing to sell me raw roving. There doesn't seem to be any kind of corporate alpaca fiber industry in this country. I don't understand it. Alpaca is the second softest natural fiber. It's softer than cashmere. The only softer wool is vicuna, and they can only thrive in the remote Peruvian mountains, tended by nomadic herders. So, vicuna aren't a really viable livestock option here in the States. Alpaca ranchers get ready to show their livestock. 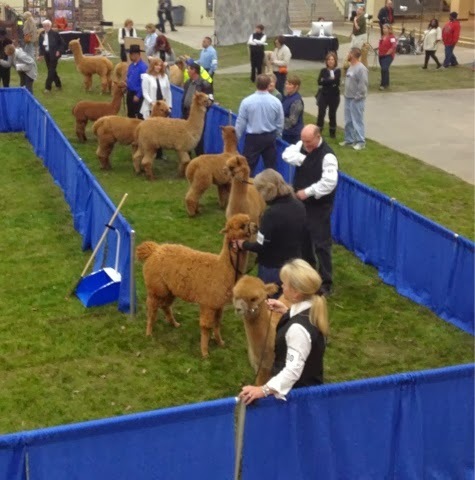 The alpaca farmers at the show seemed surprised that anyone was interested in buying their fiber. 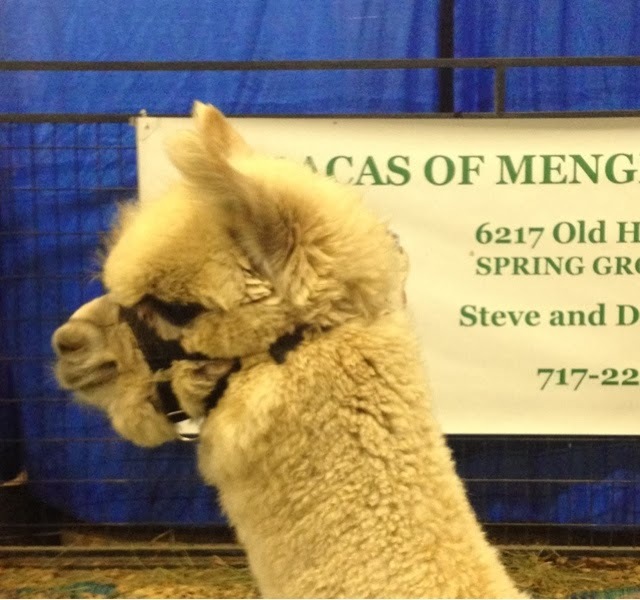 Evidently the alpaca business model primarily involves breeding and selling the animals. I feel hopeful that I might find a good supply of wool around here. I found a farm in Boone and another in Marshville willing to sell me their rovings. 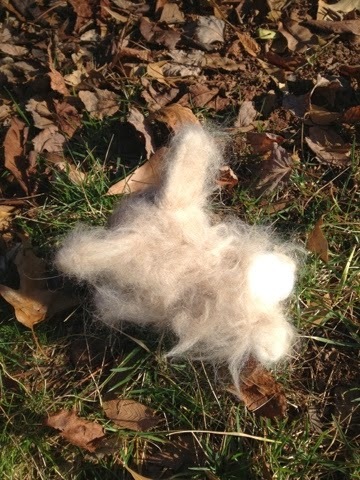 So if we can agree on a price I'll soon be swimming in economical fiber for felting and doll making and even spinning. The kids wanted stuffed animals made of alpaca. They were super-soft, but a teddy bear about 8 inches tall cost $60. 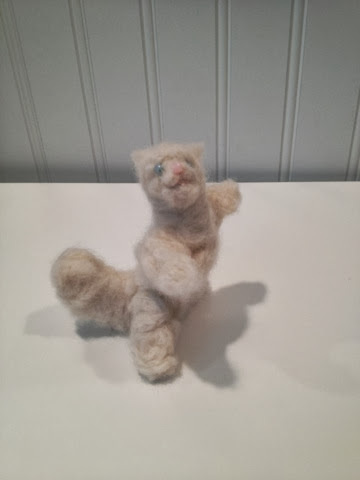 Instead, I bought a bag of carded fiber and promised to make them animals. I hope to start on those tonight. 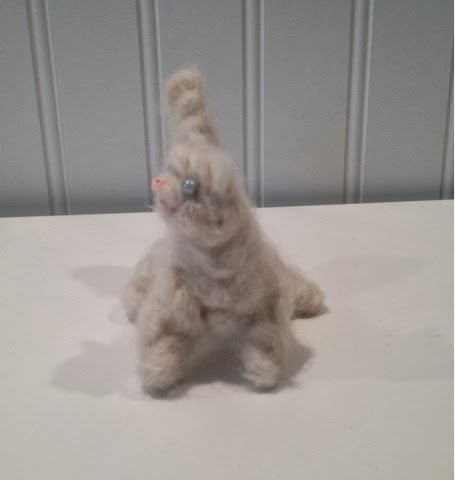 If I have any alpaca left over or if my purchasing plan works out I may be selling more felted dolls and animals in my store, so please check: http://stores.ebay.com/atelier-mandaline. Here is the second Kitty Kapers replica cat from the vintage Barbie Put-ons & Pets line of 1972. I'm getting pretty quick with these. I still am a little shy of my three hours or less goal to completion. To find out more about these, you can also read yesterday's post: http://mandalineartfulliving.blogspot.com/2014/02/all-kind-of-capers.html. 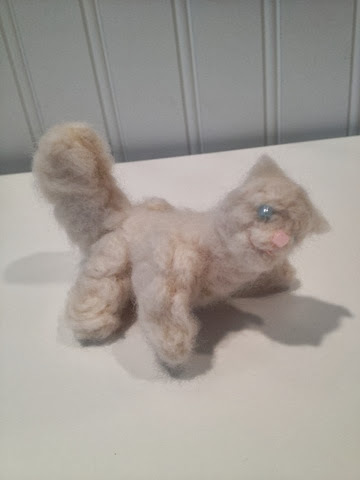 I have one of these listed in my store right now, so please check to purchase or to order your own cat: http://stores.ebay.com/atelier-mandaline. I ask for three weeks to complete and deliver these, but so far it's never taken that long. I just don't want anyone disappointed if some emergency arises and I can't finish one fast. Well, it's only Wednesday, and so far it's been a crazy busy week. We were able to head up to Asheville over the weekend and we had a great time. We traveled to Mars Hill to go snow tubing, a first for me. We had a blast, although I have a bruise the size of a grapefruit on my rear end just from bouncing around on the tube. Luckily, it didn't hurt at the time. I just have to be careful how I sit! Something about putting my store on vacation mode seems to encourage business. 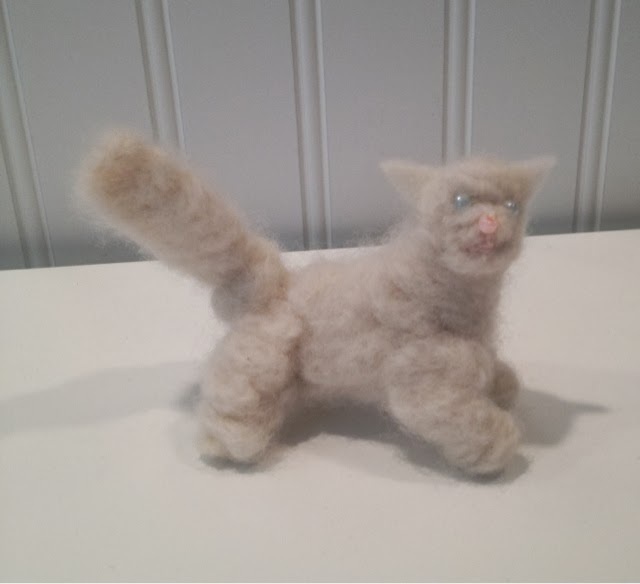 While we were away I had one sale and got another commission for a Kitty Kapers replica cat. This cat is a vintage Barbie accessory from 1972. It came with an outfit called Kitty Kapers from the Put-ons & Pets line of outfits. The pets from these sets are extremely rare, so sometimes people ask me to make a copy for their Barbie display. 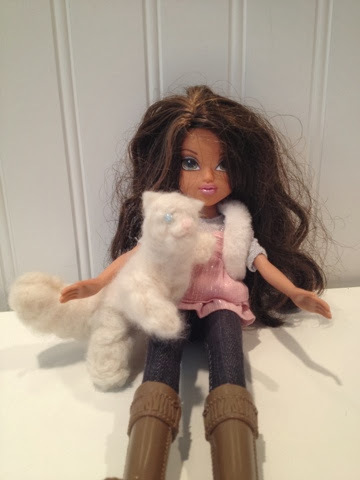 You can see my first Kitty cat and find a link to the original Barbie outfit here: http://mandalineartfulliving.blogspot.com/2013/03/kitty-kapers.html. My version resembles the original enough that I think you can tell what it was intended to be, but not so much you could mistake it for a real vintage version. The original vintage cat looks rather flat. 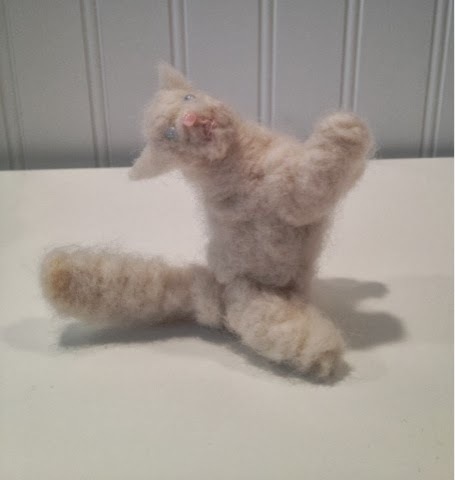 Mine has string-jointed legs to allow for some poseability and to give it some volume. 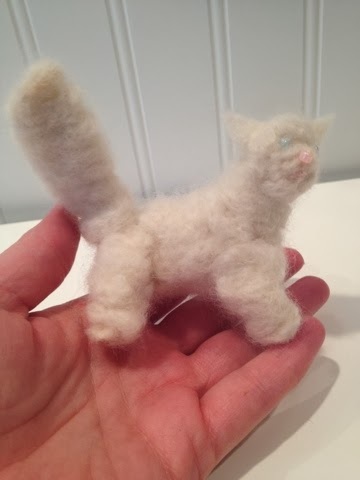 My cats are made of wool felt stuffed with bamboo-rayon fibers. 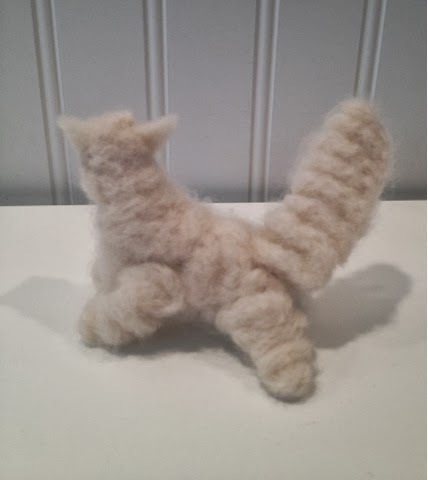 Then I felt wool blend yarn "fur" over the body. The eyes and nose are handmade Czech glass beads, so each varies slightly, and the mouth is embroidery floss. They are just the right size for Barbie and other 11 1/2 inch fashion dolls, as well as tiny Betsy McCall, Alexanderkins, and other small dolls. My kids like them just by themselves; I have to keep them on a really high shelf because otherwise the kids are always playing with them! 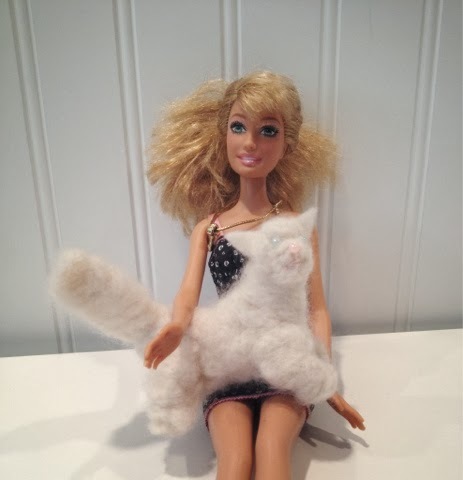 The cat fits Barbie and other fashion dolls. The eyes and nose are Czech glass beads. The legs are string jointed so they move a bit. We got home Sunday evening just in time to cook supper. My mother-in-law had been with the kids for two days so I figured she was probably tired of fixing meals for them. 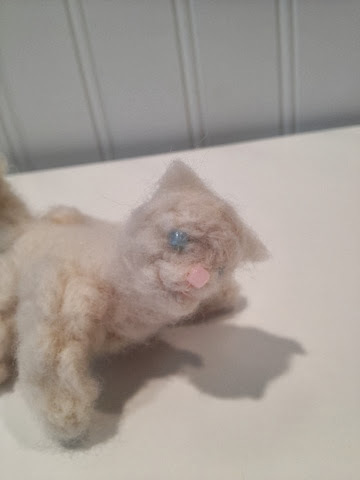 I dug out my Kitty pattern and materials and started on the cat Monday. I try to finish these in three hours or less, although right now I'm still right around three and a half hours. Once I take out the cost of materials, eBay fees, and shipping my profit puts me making less than minimum wage! That's pretty sad for a copy of a vintage cat that, with the original Barbie outfit included, sells for around $900! Since I was sore Monday night from my tubing bruises I skipped my run and got it all finished. Unfortunately, the client doesn't like that one. I looked at the original Barbie cat as a reference, but the customer prefers my version. That's flattering! So, I made another one today, only using my first one as reference. 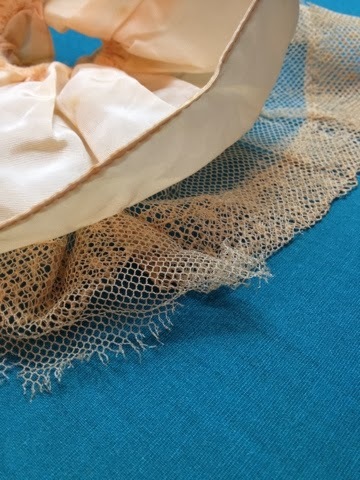 I will be listing Monday's version (shown here in this post) in my store, so please check: http://stores.ebay.com/atelier-mandaline. Also on Monday, my sister's family stopped in for lunch and so my nephews and son could have a play date. Yesterday my son's class made up their Valentine's party, which they missed because of the snow. It's amazing to think there's still snow on the ground, since it's 70 degrees today. I'm sitting here in a short sleeve shirt feeling hot! Tomorrow I have my littlest one's parent teacher conference and then I really need to get started on listing a mountain of outgrown kids' clothes in my store. Keep watching for those! 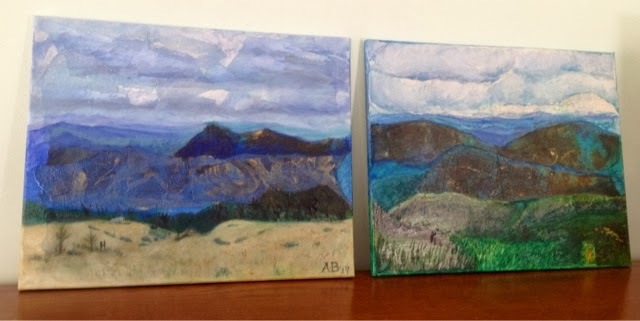 I've had the Blue Ridge Mountains on my mind again, especially this week. 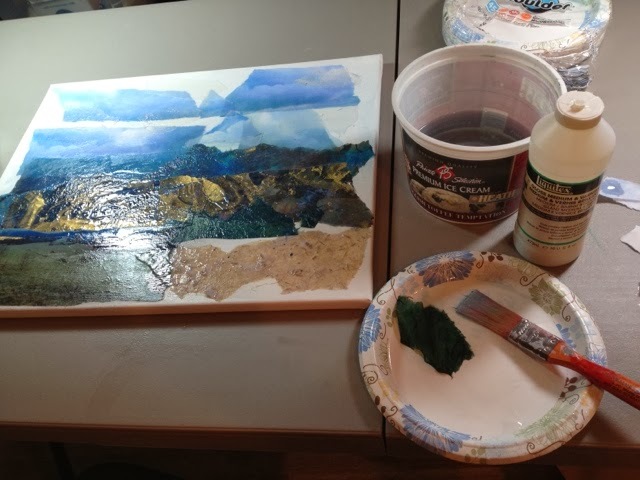 Last year, you may recall, I painted a mixed media mountain themed piece for my husband's Valentine's Day gift. Right away, he requested a companion piece. 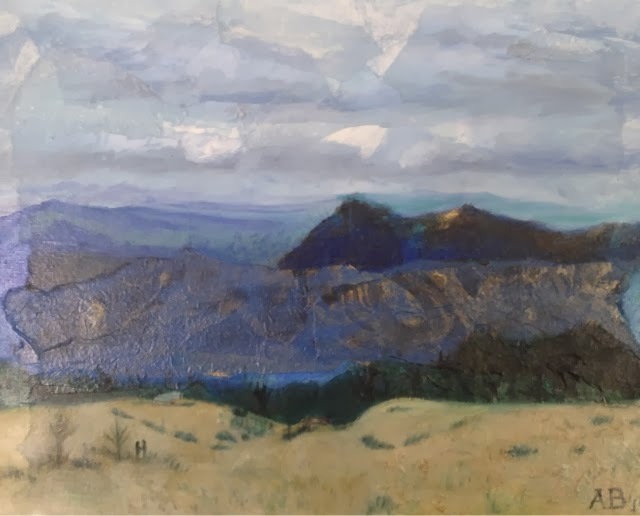 I painted the view from Beech Mountain last year, but he wanted an Elk Mountain piece to depict a favorite farm of ours. If I could pick out any farm on Earth it would probably be this one. 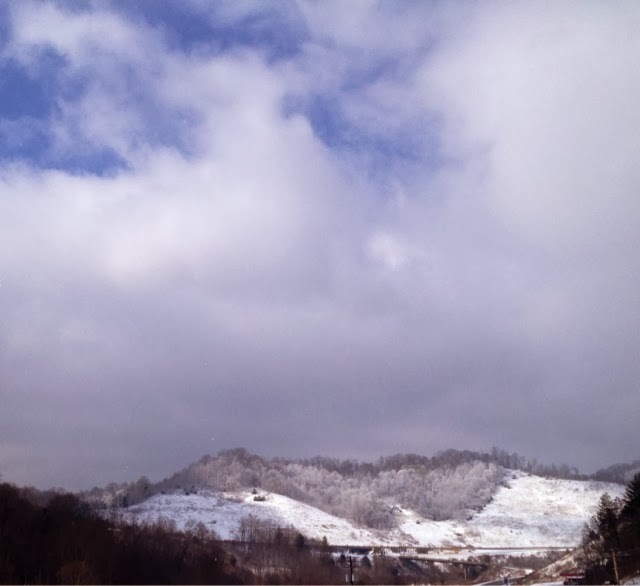 It's nestled in a little valley on Elk Mountain, but is still high enough to have spectacular views. It's flanked by a large pond and woods. It's just a storybook sort of farm. However, the loveliness doesn't change my perverse nature; I just don't like being told what to paint! I think many artists are that way. The minute you dictate a subject, all inspiration flees. My grandfather had an oil painting depicting a Viking ship. He got it when he commissioned the painting and told the artist, "Paint anything but a boat; I have too many paintings of boats." Well, after that, all the artist could think of was a boat! Luckily, the painting turned out well and Grandpa always had a funny story to tell. It's just so true, though, that inspiration is a mysterious and fleeting thing. It took me a while to get into the mood to paint this piece. Poor Jerry had to wait a long time. If I don't have the right feeling about a piece I know it's not going to turn out as well as it should, but finally I got into the proper spirit. This is probably because my mind has been dwelling in the mountains recently. 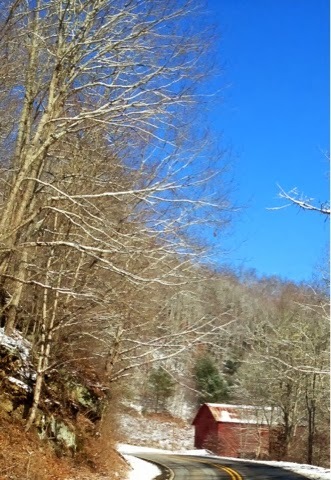 We planned a trip up to the Asheville area, including Elk Mountain, this weekend and weren't sure we could go with all the snow. The train ferrying my mother-in-law to babysit was cancelled for two days, so we didn't know if we'd get a sitter. The train ran late today, however, but it did run, so when she arrives we'll be on our way. We had to change our supper reservations to 10PM, though! As with last year's piece, I started with a collage layer and then painted over it with oils. If at all possible when doing collage, soak the papers in water and dab them dry before you apply them. This will keep them from buckling. I learned that trick from Paul Hartley, a wonderful painting professor of mine at ECU. He would actually work in collage on glass, backwards. 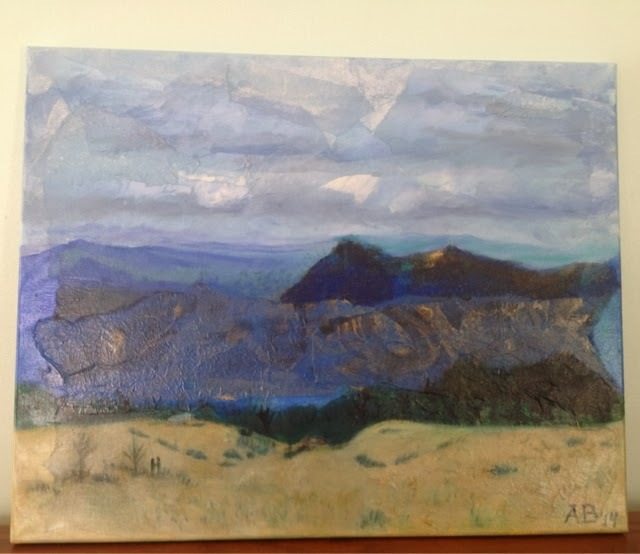 He applied the collage, then painted behind it. Then he peeled the whole thing off the glass, applied it to a board, and painted over top of it. The resulting pieces were remarkable, beautiful mind teasers. It was impossible to tell what was collage and what was painting. He was, needless to say, an incredible talent and could paint photo-real depictions of almost anything. We lost him way too soon. Another great professor of mine, Craig Malmrose, advised Yes glue for papers too delicate to soak. Although he taught typography he was talented with graphics as well. I'm pleased with the way this painting turned out. I like it much better than last year's. That one looks like a crazy person painted it, and it's in my bedroom so I have to see it every day. The new one is smoother, and it's a good companion piece to the other. I think I will enjoy it more! May you have a wonderful Valentine's Day and a lovely weekend!